I've been struggling to manage my health since February. It's been one ailment after another, continuous effects from chronic Lyme disease. It's been nearly 6 years since I first got sick. I am overwhelmed with the unknown of it all. I want to move with purpose but right now I am drifting. I don't know where I'm trying to go. I don't know that I have it in me to figure it out right now. Right now feels like forever. 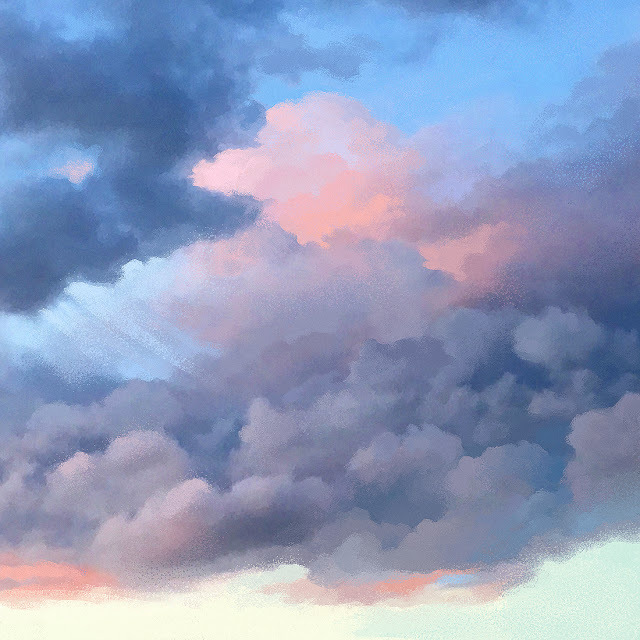 So I will keep floating and enjoy the clouds as they pass overhead. Do you like the idea of spending $20/month to get an 8x10 print of my latest doodle and access to my latest coloring page? 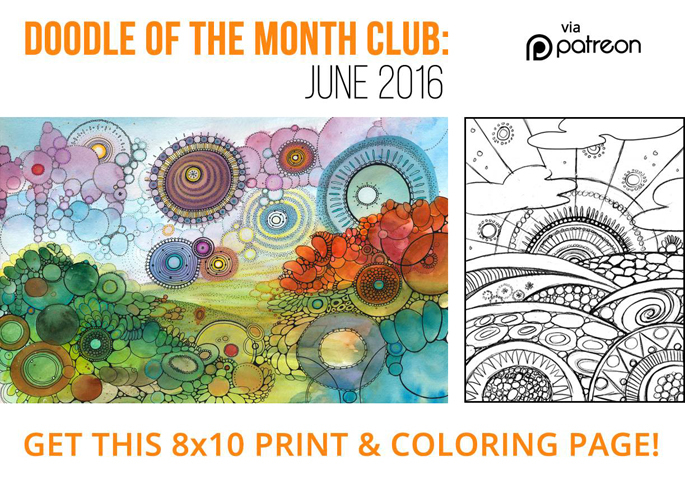 Then consider joining my NEW Doodle of The Month Club via Patreon! There are other patron levels (from $5 to $50 per month with cool perks plus one $150 slot for a custom doodlepainting) and every bit of support helps make my world a little more colorful and a lot more doodly. Visit my Patreon Page to see a full list of levels and perks! 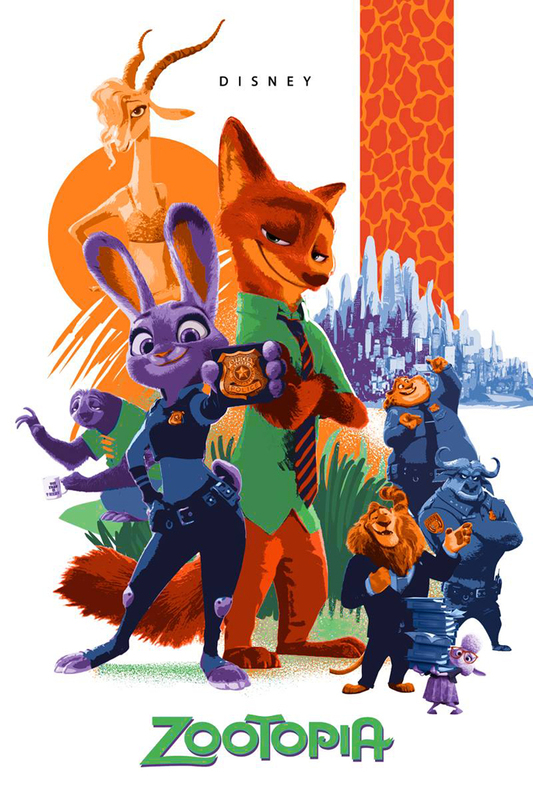 I'm working on another fan art movie poster, this time for Zootopia. My husband and I adore the movie and would love to hang a poster for it on the wall. At this point this image is just a Photoshopped collage sketch---I haven't drawn the characters myself yet. 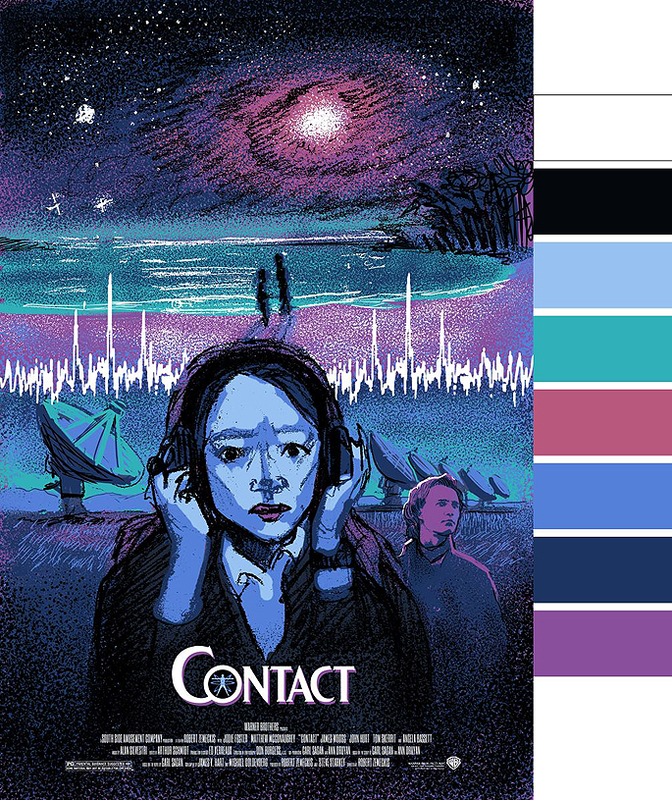 I start by pulling the individual images I want off the internet, moving the pieces around, scaling, cropping, adding some of my own design elements, selecting a color palette, converting the images to flatter blocks of color within that palette, and quickly painting things in to connect all the pieces. It's a few hours worth of thinking through the design, and it's a very different method than drawing from scratch. Still need to condense the number of colors and simplify the shapes. But I'm happy with this start. More to come! I had started in on my design for a Practical Magic poster last year and while that is definitely still on the TO-DO LIST, I've bumped Contact up to the top because it's a simpler idea that will let me figure out technique without getting caught up in details. So here is my crude sketch and quick color study. I narrowed it down to 8 colors, and if I used purple paper I could get it down to 7 printed colors. I was figuring out if I want more or less around Ellie, and threw Palmer in there, but have decided to leave it just Ellie.